At first glance a tablet equipped with a built-in projector seems like a novel but perhaps limited idea. Having had the opportunity to spend several days with the Yoga Tab 2 Pro, first impressions tended to change. To see just how they changed and for better or worse, read the full Lenovo Yoga Tab 2 Pro review below. The Lenovo Yoga Tab 2 Pro, despite being a mouthful of a name, is also quite a handful. A very nice looking aluminum tablet, it has the familiar Lenovo bulge at the base, where an extra large battery is stored. This bulge also plays host to two of the Yoga Tab 2 Pro's nicest features: a built-in Pico projector and a kick stand that can be used to prop the tablet up when typing, to stand it up to watch a movie or even to hang it from a wall. The tablet is quite large but it weighs in at just under a kilogram (or 2.09 lb). Considering it is about the same size as many laptops the weight is quite good. The front of the bulge holds two 1.5 Watt JBL stereo speakers, and the display is surrounded by a wide black bezel. A front-facing camera is the only other visible feature on the front, although an ambient light sensor is also there. On the left-hand side, just above the bulged hinge, is a volume rocker, USB 2.0 port with OTG and a headphone port. An oversize power button lives in one end of the bulge and the Pico projector hides in the other. The right hand side has a single button for turning the projector on and off. On the back of the Yoga Tab 2, right next to the projector lens, is a focus slider and there's a cutaway section in the hinged stand where a button (for unlatching the stand) and the main camera are located, along with a 5-Watt JBL sub-woofer. The Yoga Tab 2 Pro looks a treat, but the more you use it the less well-designed it feels. Things just seem to be awkwardly placed. When carrying the tablet one-handed you naturally smudge the main camera lens and when taking photos you can't help but hit the volume buttons or smudge the projector lens. Altogether it's just a bit ungainly. The Lenovo Yoga Tab 2 Pro price is 499.99 USD – it is the only Yoga Tab 2 to run on Android and have a built-in Pico projector. 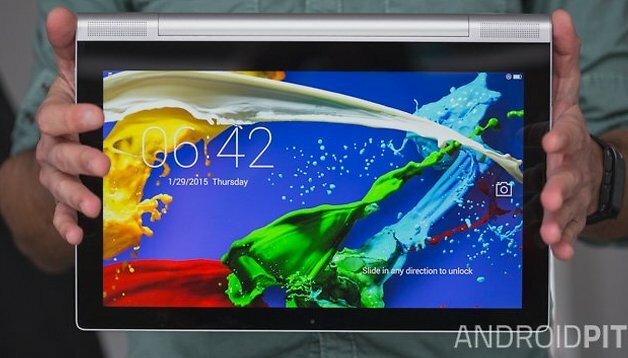 The Lenovo Yoga Tab 2 Pro release date was late October, 2014. The Yoga Tab 2 Pro specs include a very large 13.3-inch QHD IPS LCD. Even with 2,560 x 1,440 resolution though, when it's spread across that much screen it's all a bit like not enough butter on too much toast. The pixel density drops to a very low 221 pixels per inch. That's about the same as the original Nexus 7. The LCD display itself is quite good though; colors are nice and bright with good viewing angles. It is quite easy to spot individual pixels with the naked eye though, so don't expect super sharp images on this big boy. The most obvious selling point of the Yoga Tab 2 Pro is the Pico projector built into its base. The image projected by this is really quite good, despite being of very low resolution (WVGA or 854 x 480). I projected a two meter-wide 16:9 film on my wall across a span of around four meters and even though the film was almost entirely set at night, the image was actually quite impressive. The focus slider helps tidy up any fuzziness, although I did find the slider itself to be a bit sticky. The resolution may not be great, but then again, neither is the projector in a cinema. Realizing you can project anything on-screen onto any flat surface is a pretty revolutionary idea. No need for cables, projectors or any other add-ons, the Yoga Tab 2 Pro means you are always ready to do a presentation, play a game on the big screen or enjoy your very own cinematic experience no matter where you are. However, while the Yoga Tab 2 has automatic key stoning, it didn't seem to work so well for me. I could see the keystone correction attempts but they rarely resulted in anything rectangular. The kick stand is a bit weird too. It just seems awkwardly placed when trying to project (because it doesn't go the end of the tablet) and I found myself continually struggling to balance the tablet on various objects to get the right projection angle for my wall. My table is nowhere near high enough to project flat onto the wall without needing to elevate one end and the shape of the tablet and kick stand are not very helpful. Again, a great idea not so successfully implemented. At least hanging the Yoga Tab 2 Pro was simple, but again, it would be nice to have a little notch in the center of the cutaway for those times you only have a single nail or hook to hang it from. The Yoga Tab 2 software is a peculiar iOS lookalike with no app drawer, a slide up command center at the bottom and very Apple-like icons. It is smooth enough, but does tend to be quite slow overall. It currently runs Android 4.4.2 KitKat. The slide up drawer replaces what Android normally puts in the Quick Settings: so you've got toggle access to various settings and features like Bluetooth, Wi-Fi, GPS, Airplane Mode, auto-rotate and brightness. The slide up drawer also has some Lenovo-specific features like a projector shortcut, screenshot button, Lenovo Smart Switch (which adjusts the display settings depending on how you are using the tablet: standing, tilting, holding, hanging or even a custom setup) and Dolby audio. The Yoga Tab 2 Pro also features a kind of mini app drawer, accessed by a small button in the bottom left-hand corner, which pops up a kind of rapid access app list for multi-window mode. Swiping down from the top of the screen opens up a quite sparse notifications window with a shortcut to the settings – but only to the notifications settings. Weird. In the settings, menu proper things look a little more standard with a split-screen arrangement. A few things you might notice are a lack of NFC and tethering capability (the Yoga Tab 2 Pro does not hold a SIM card although it does have a slot for microSD expansion). You will get dedicated sections for tweaking projector performance, sound (the Yoga Tab 2 Pro comes with Dolby and Wolfston audio processing and the sound quality really is very good), multi-user profiles, auto-power off, a power manager and multi-window mode. The Yoga Tab 2 Pro also comes with a few apps pre-loaded you may not expect, like Skype, Facebook, Twitter, Kindle and Evernote, but these are apps you would most likely install yourself one day anyway. Lenovo also has its own suite of apps on board: SYNCit, SHAREit, CLONEit and Sketchpad which I'm sure you can figure out on your own. They're helpful enough, but are also easily replaceable with your own personal favorites if you don't like them. This is where the Yoga Tab 2 Pro starts to fall over (not for lack of a kick stand). The hardware inside is not up to scratch with a lot of high-end tablets. While it could be said that Lenovo isn't positioning the Yoga Tab 2 Pro as a high-end device, the presence of the word ''Pro'' in its name seems to say otherwise. The tablet is powered by a quad-core 1.86 GHz Intel Atom Z3745, with 2 GB of RAM and 32 GB of on-board storage. While this is perfectly good enough for a family tablet, don't expect to be wiling away the weekend playing hi-res games or using the Yoga Tab 2 Pro as a replacement work tablet. Sure, the screen size makes it great for spreadsheets and other work-related tasks, but it simply doesn't have the guts for processor-heavy demands or rapid multi-tasking. Its success as a productivity tablet comes down to your definition of productivity: if sorting your photo album, posting to social media and reading emails sounds about right to you, then this tablet will suffice. For everyone else, look elsewhere. This is another weak point of the Yoga Tab 2 Pro. The 8 MP main camera is capable of capturing some OK shots, but it struggles under anything less than ideal conditions, which at this time of year (in the Northern Hemisphere, at least) are pretty uncommon. Low light, overcast skies, gloomy settings: all the winter standards are no friend of the Yoga Tab 2 Pro camera. Color accuracy is quite good without leaning to oversaturation, but focusing is quite abysmal, with one of the slowest auto-focus speeds I've seen on an Android. There's no HDR mode, but you do have macro, panorama and night scene settings, along with some manual controls and filters. This is another place the size of the tablet becomes an issue though: it's actually quite difficult to hold the tablet, tap the screen to focus on a particular area and then hit the shutter button without fumbling or nearly dropping it. Add to this the constantly smudged lens glass and poor placement of the physical buttons and photography becomes an exercise in adaptation. Of course, you could simply rotate the tablet through 180 degrees so the camera is at the top, but this is completely opposite to the way you tend to use it the rest of the time and makes it very top-heavy. One of the best parts of the Yoga Tab 2 Pro is the battery. At 9,600 mAh, the battery is large enough to support that huge QHD display through a couple days of casual usage. At 100 percent brightness, I regularly got five-and-a-half hours screen-on time, without any power manager features set. With some power settings tweaks, 50 percent brightness and using the projector a fair bit that number crept up by another three to four hours, but I never got close to the 15 hours Lenovo claims. Whether you like the Lenovo Yoga Tab 2 comes down to what you use a tablet for: if you want a large colorful display, good battery life, great speakers, lots of pre-loaded software features and the awesome ability to project anything you want anytime and anywhere, then this is a great tablet for you. As a basic multimedia device the Yoga Tab 2 is right up there. If your idea of a tablet is one with a crystal clear display, high performance specs for hi-res gaming and ultra-portable, this is not the tablet for you. The Pico projector is pretty great, the battery life is solid and there are some good software features, but the laggy and unintuitive iOS-like interface, poor camera and sub-par performance go against what is otherwise a well-built (if not entirely intuitively designed) tablet.